APPEL FARM IS PARTNERING WITH LIGHTED WAY EQUESTRIAN CENTER TO OFFER HORSEBACK RIDING LESSONS TO CAMPERS! Campers travel 12 minutes away to Lighted Way Equestrian Center along with an experienced riding instructor from Appel Farm. Campers attend two-hour classes, Monday through Friday during both minors. Instruction offered for beginning through advanced campers. Families are invited for a performance at the end of each session. 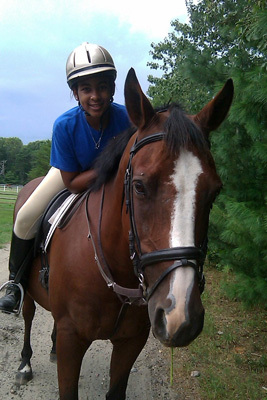 Lighted Way Equestrian Center, a prestigious farm located just 12 minutes from Appel Farm, in Bridgeton, NJ, has created a specialized program for Appel Farm campers to combine horseback riding with the arts. For an additional cost, campers can choose to enroll in the program as both of their minors and will spend every afternoon learning about horse care, riding techniques, dressage style riding, and even jumping, and will work towards a choreographed performance on horseback. Lighted Way fosters an environment that encourages campers to build their own confidence by guiding them through an understanding of the horses and their relationship with them. Campers are given personalized instruction, tailored to each individual’s skill and comfort level, that encompasses all aspects of horsemanship. The horseback riding program at Lighted Way not only gives campers a new or refined skill in working with horses, it honors the spirit of the artistic programs offered at Appel Farm, such as creativity and responsibility. Riders learn riding skills, and at the end of the program, present a choreographed musical performance on horseback to demonstrate their knowledge and abilities. Our summer camp curriculum in partnership with Lighted Way offers riding instruction for riders of all disciplines and skill levels. Whether campers have never been near a horse before, or if they are accomplished equestrians in western or English riding, we have something to offer. We believe in a thorough equine education including care and theory of training as well as riding for competition and pleasure. Our campers are free to enjoy horses in a fun, wholesome, family-oriented atmosphere. Check-In Day at Appel Farm Arts Camp!